Above is the famous painting “Pollice Verso” by Jean-Léon Gérôme. Whether it’s an election year or not, contending parties clash in the arena of our institutions, with the public being ultimate judge of which side emerges victorious in the end. 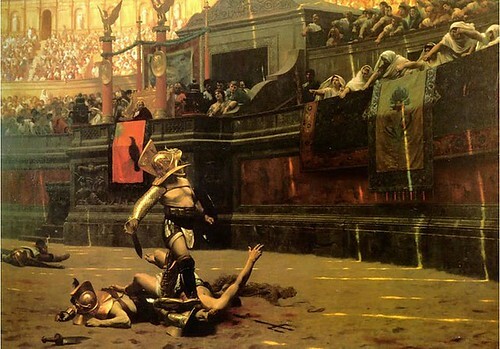 There is a gladiatorial aspect to politics, of course: an often brutal slog to achieve acclaim from the crowd, without which one faces political death. Citizens may look at net worth, on attendance, on voting records, but also, it’s how individual officials handle themselves in the midst of controversy -and the positions they take during the controversy- that allows voters to consider whether to support or oppose candidates and parties. Both the party Manuel Villar Jr. now heads, and the chamber, the Senate, he once headed and to which he still belongs, have their traditions based on confronting challenges, whether to achieve victory on the issues, or to turn defeat into a kind of victory. Yesterday’s Senate session ended up as badly as debates in the House of Representatives, as one side adopted the tactics of the administration to sidestep the issues, while the other thundered and shrilled more out of a sense of brittle amor propio than in relentless pursuit of the issue at hand. Miriam Defensor Santiago weighed in today, with what began as an exposition on the rules that were a smokescreen for her abandoning the field of battle. What began as a call for statesmanship and considered debate, end up with her taking a cue from yesterday’s petulance on all sides. I thought that Joker Arroyo, yesterday, let slip something interesting. If Villar is being charged with using public office for private gain, then why is it, he asked, that there isn’t corresponding scrutiny of the DPWH without whose cooperation Villar’s schemes wouldn’t have come to pass? A valid point, but it was an argument that slipped perilously close to tacitly endorsing the view that Villar is the President’s real candidate (the others are just her decoys is one view; another is that multiple candidates expand the potential of finding one to fully back as the campaign heats up): but no one took up the opportunity to pursue it. Instead, a petulant obsession with amor propio led to senators charging every time the defenders of Villar waved red capes to deflect attention and to prevent a cohesive case from being presented. But this issue is only one of many. They all revolve around whether or not Villar unduly fostered his financial interests by means of public office, disregarding reasonable limits on the holders of public office (declarations of potential conflict of interest, and divestments). The question was first raised by Joker Arroyo in the House of Representatives in a Privilege Speech on August 17, 1998 (see also the Q&A that followed). Along the way there are other issues that go beyond government contracts, and involve how he has treated commercial rivals and small property owners: the blog The Philippine Experience has focused on related issues in recent months (see, in particular, the entries for December 20, 2009, January 2, 2010, and January 7, 2010). “If there’s ever a doubt, there is no doubt”. Hope this saying was told to the judges who gave Marcos a reprieve knowing he shot Nalundasan and to the people who voted for GMA knowing she promised not to run for election. And now we have Villar, whose record contains more doubtful specifics than a Chinoy businessman’s tax return. Gee I wonder what kind of president he will be? As to what kind of president, I don’t know. But as to wealth, there’s no doubt he has the acumen to give Bill Gates a good run for his money. It is fitting I suppose that you use the analogy of gladiators battling in the Roman Coliseum rather than citizens debating in the Athenian assembly to describe our senators and by implication our democracy. I believe that the Committee of the Whole has dealt a mortal blow to Villar. His poll numbers should start to hemorrhage in favour of Estrada mostly. I don’t think Villar can play the sympathy card any longer. The line that Estrada had the courage at least to face his accusers seems to resonate. With the 12 in the majority taking a stand, it is hard to imagine how Villar as president could lead and manage the country within his first 3 years at least assuming that the composition of the upper chamber remains the same during that time. His brand as the “natural born leader”, “competent” and “results oriented” candidate seems shattered. I wonder what happened between Joker’s privilege speech against Villar in the lower house, years ago, after the latter was elected as Speaker, and last Monday. Besides being a monstrous hyperbole, that statement won’t stand even when comparing Villar to Manny Pangilinan, for example. As for acumen, the man must have talent and foresight in order to have built a rather impressive enterprise. But nothing in the innovative scale of Microsoft or Apple. And, if reports are true, nowhere as Machiavellian as Bill Gates. You ain’t seen nothing yet. Wait ’til he become president then let’s see who between us has the more effective crystal ball :-D.